Not only can the Family Kabins team create a beautiful log cabin for you, but they take pride in designing and building hand crafted furniture to compliment your new cabin. 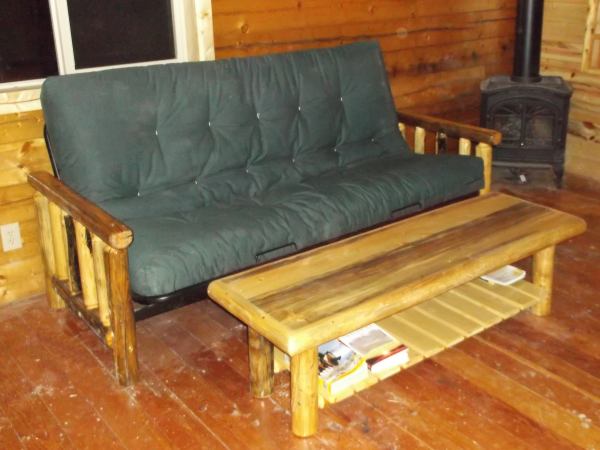 The pieces we make are all very well built and designed to match the rustic features of your cabin. From beds, dressers and night stands to dining room tables with matching chairs to couches, coffee tables and end tables, every piece is hand crafted. Don't forget to consider what you need for the outdoors as well. Family Kabins can build you a barn, a playhouse, a picnic table, a swing, a garden bench and much more. The Family Kabins staff are passionate about providing log furniture to those who appreciate the rustic beauty of natural wood. "We don't just sell a rustic lifestyle," says owner John Schmidt. "My family and I live it." Give us a call with your log furniture ideas and we will work with you to create handcrafted log furniture that is designed to last a lifetime. Each piece of Family Kabins custom-designed furniture is made with skill and care. The furniture is then meticulously finished with premier stains to preserve the natural beauty and finish of the wood.